(2) Combine everything. Knead for 5 to 10 minutes until the dough is about as soft as your earlobe. If the dough becomes too stiff while kneading, it’s OK to add some of the yeast solution. When you finish kneading, form the dough into a round shape. When the dough begins to dry out, cover it with a damp cloth. A finger test will tell you when the first rising is finished. 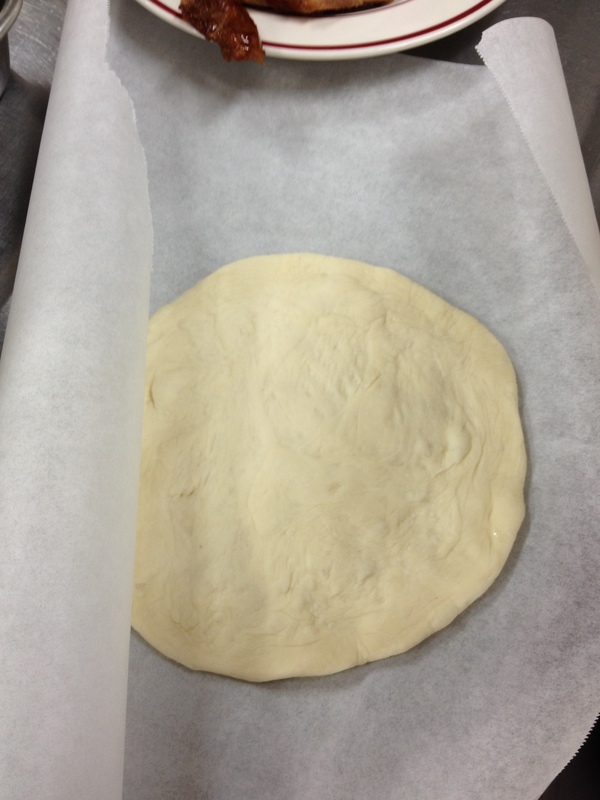 Put some flour on your index finger, plunge your finger into the middle of the dough and pull it out. If the hole you make does not close up, the dough is finished rising. (4) Once the first rising is finished, press the dough out with the palm of your hand to let the gas out. Cut the dough into 4 equal pieces and make each into a ball. Set these aside for about 20 minutes. (5) Use your fingers to flatten each ball into a more or less round shape. Do this by pressing from the middle outward, stopping a couple centimeters before reaching the edge. The idea here is to press the gas in the dough to the outer edge. Do this until you have 2-3 millimeters of thickness for the inner part of the round, then transfer to a sheet of baking paper. Please note that there are other methods for shaping the pizza dough and various opinions on what works best. (6) Preheat an oven to 200-240℃. Add toppings to the pizza dough. Once the oven is up to temperature, you can begin baking. Your pizza should be done in about 10 minutes. Baking time will differ depending on the oven. Keep an eye on the pizza as it’s baking to ensure best results.